An oil field in New Zealand need a pump that could pump produced water from a well 3 – 4km back to a treatment plant (which also included going up and over a hill). Some of the challenges faced included the high salt content of the water (greater than 2%) and the fact that the pump was going to be in a hazardous area. The duty point required was 1,000l/min at 1,000psi. 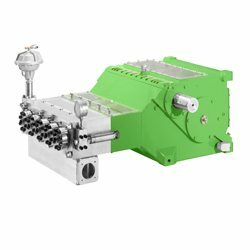 Pump & Valve supplied a Kamat K20095 triplex piston pump manufactured in Germany. This pump is capable of 957l/min @ 105 bar (1,522psi), has a duplex stainless steel pump head and was coupled to a 200kW Exd motor.